A significant gap exists between the political settlements literature and the mainstream feminist literature on women in politics. 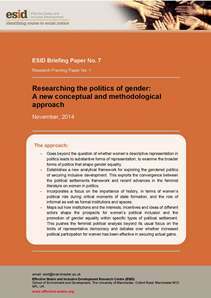 Until recently, feminist political analysis has not engaged effectively with the insights offered by the new literature on political settlements, particularly regarding the extent to which informal and clientelistic forms of politics closely shape the prospects for women’s empowerment. Combining these two bodies of literature is therefore significant for generating a deeper understanding of how politics shapes the possibilities for greater inclusion of women and promotion of gender equity in development policies, processes and outcomes in developing country contexts. This approach also has relevance for understanding how other marginalised groups may propose alternative interpretations of inclusive development and how these are negotiated.